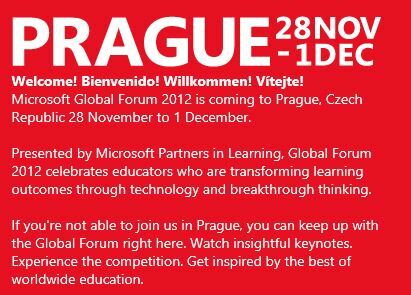 In three short weeks from today, we will gather in Prague for the Partners in Learning Global Forum. To say this is a big deal here at Daily Edventures is an understatement. That is why I am especially excited that Kirsten Panton, the Partners in Learning Director for Western Europe, joins us today. Before Panton came to Microsoft nine years ago, she spent 11 years working at the largest business college in Denmark, Niels Brock. At that time, the college had ten different locations, approximately 50,000 students (covering K10-12, higher education and lifelong learning). Panton began teaching marketing and accounting. Soon after, she became program manager, and then rose to head of information for the college. And now it is my privilege to share today’s Daily Edventure, Kirsten Panton. (And make sure you don’t miss Panton’s description of judging at the Global Forum, below). Visionary policymakers who dare to take the full step away from 20th century assessment. Before this happens we will not see the new paradigm of learning. What advice would you give an educational policymaker? century? What do students need to master apart from reading, writing and math? Then create a curriculum, assessment and a school system that is supporting these demands. What educational “trend” do you think is helping students? Technology implementation is definitely a big help – IF the teachers are ready to implement and integrate technology into the learning process. As I have been with Partners in Learning since the very beginning of the program (more than nine years ago) – I have been lucky enough to have attended all Partners in Learning European Forums and all Global Forums. It has been great to be involved in the development of the judging process. We have developed both the judging categories as well as the process. Up until two years ago we only had three categories: content, collaboration and community. And we fully relied on the judges having a mutual understanding of both the categories and how to judge the projects. methodology based on the research. What we are aiming to achieve is fairness to the educators. Over the years, we have realized that we often change peoples’ lives when they become winners. With that in mind, we find it very important to treat the judging process with a very high degree of professionalism. This also means that the judges are an international team of people with roots in education and high-level jobs at higher education institutions, ministries of education, third-party organizations, etc. The Global Forum is for educators. It is about having fun, meeting up, networking, collaborating and creating new friendships and opportunities for future collaboration. I am so excited about the Eighth Forum in Prague and look so forward to meeting both judges and educators. Person who inspires me most: My husband never stops inspiring me. But on a macro level, I’m inspired by many people. If I should highlight one it would be Nelson Mandela. Next travel destination (work or pleasure): Paris, Genoa and then Prague for work….. When was the last time you laughed? Why? Two minutes ago – the team I sit in at Microsoft has a GREAT sense of humor. We laugh a lot. Your favorite quote or motto: If there is a will, there is a way. This entry was posted in Building Teacher Capacity, People and tagged Microsoft Partners in Learning, microsoft partners in learning global Forum. Bookmark the permalink.